Ethical search engine optimization - exposed! Home / Search engine optimization articles / “Ethical” Search Engine Optimization Exposed! “Ethical” Search Engine Optimization Exposed! and I will provide an eye-opening example of the failure of so-called “ethical” search engine optimization by one of its most prominent advocates. But first I want to make something clear. Just because these people have chosen to use the word “ethical” to describe their methods, with the implication and statements that doing what they don’t approve of is unethical, does not mean that it is true. They simply misuse the word “ethical” in an apparent attempt to denegrate people who use methods that they don’t approve of, even though all of what most SEOs do is perfectly ethical. 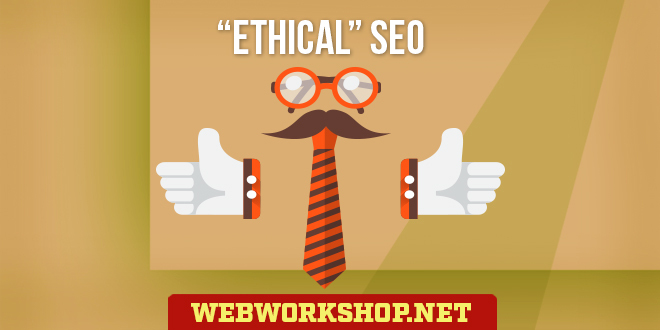 What do they mean by “ethical” seo? Search engine optimization means doing things to and for a website and its pages in an attempt to gain higher rankings for the site than it would otherwise have. Part of it is modifying a site’s existing web pages so that they more closely match a search engine’s ranking algorithm, and other parts include creating additional domains and special pages (doorway pages) that are designed to rank highly. Information on some of the methods can be found here. Self-styled “ethical” search engine optimizers accept certain methods but not others. Those that they accept, they call “ethical”; those that they reject they call “unethical”. Basically, they say that a site’s genuine content pages are the only pages to perform search engine optimization on in an ethical way, and that it is unethical to create new pages for optimization purposes if those new pages are not incorporated into the site as genuine content pages. Also, they differentiate between the different things that can be done on the content pages so that some methods, such as hidden text, are unethical, whereas some other methods are not. Their rule of thumb is:- if it can seen by site visitors as a genuine, integral part of the website, then it is ethical; if it is hidden from site visitors, or is seen but not as a genuine, integral part of the website, then it is unethical. For reasons best known to themselves, they simply do the search engines’ wishes. There are some search engine optimization methods that the engines don’t want to be used; e.g. hidden text, cloaking, doorway pages, etc. Even though the engines care nothing for any website or for any search engine optimizer, these people do the engines’ bidding – and they preach it to anyone who will listen. Some of them probably adopted the attitude from others who frequent the smaller forums and, without thinking it through for themselves, they presumably accept that it’s the only right way of doing things. Most of these people won’t discuss or debate any of the so-called unethical methods; they simply state that they are unethical, and that’s that. When the occassional discussion does get started, they soon find that they have no answers to the opposing points, and they usually either disappear (stop posting) or resort to insults. Their reluctance to discuss the issues is understandable, because they don’t have any rational or common sense arguments in their favour, except that it’s against the engines’ wishes. It’s ok for them to follow the engines’ wishes but it doesn’t explain why they brand some things as ‘unethical’. Unethical = wrong in a moral sense. It is my considered opinion that the self-styled ethical SEOs insist that their views are the only right ones because they are simply incapable of doing real search engine optimization. They are capable of making websites and pages search engine friendly – something that can be learned in 30 minutes – but they have no abilities beyond that (see this example). Therefore, it would be in their best interests if all optimizers came down to their level so that they have a chance of competing. I can’t say that their idea of search engine optimization is wrong. If it suits them, that’s fine. What I can say is wrong is the way they openly declare that certain search engine optimization methods, of which they disapprove, are unethical. To be unethical is to be immoral, or to be wrong in a moral sense. Even though they cannot explain what is morally wrong with any of the ‘unethical’ methods, they still make the claims, and they do their best to tarnish people who use them by declaring them to be unethical. That’s unethical! Because the engines disapprove of some search engine optimization methods, people who use them run a slight risk of having the website or page penalised. It would be unethical for a search engine optimizer to use the methods on clients’ sites without the client knowing and accepting the risk. ‘Ethical’ SEOs agree with that, but they don’t stop there. To them, any use of the methods is unethical – even if done with full knowledge of the risks involved. To them, it’s a matter of principle – the methods that they disapprove of are unethical, and that’s that. I call this an “eye-opening” example (of the failure of ‘ethical’ seo) because of who it is that failed. I’m not going to divulge the person’s name, so I will refer to him/her as male, which may or may not indicate the person’s actual gender. He is one of the most prominent of the self-styled ‘ethical’ SEOs, if not the most prominent. His prominence is due to several things:- (1) he is frequently paid to speak as a search engine optimization expert at seo conferences, (2) he is very active and visible in more than one SEO forum, (3) he produces a regular SEO newsletter which is read by thousands of people. In each of those platforms he advises the same thing over and over again; i.e. there is really no need to use ‘unethical’ methods; do it the way that I do it (ethical seo) and the high rankings will follow. Also in those platforms, he is known to use such insulting words as “scummy” and “scumbucket” to describe what he thinks of as ‘unethical’ SEOs and methods. This person is a shining beacon for the self-styled ‘ethical’ SEOs, and his advice is continually listened to, and swallowed, by many thousands of people. So it was a great pleasure to me when I received one particular email from him. His problem was that his efforts had failed. His ‘ethical’ seo didn’t work – hence the email to me. He was looking for other methods that he might use and, to be fair, he was only looking for methods that would stay within the search engines’ guidelines. The point is that so-called “ethical” search engine optimization can’t compete. It only works when there is little or no competition. My guess is that the search terms that he failed with can’t have been all that competitive if a person with his experience didn’t realise how competitive they were from the start. When pushed, he has been known to admit that the “ethical” seo methods can’t compete when the search terms are competitive, and yet he continues to advise people that there is no need to use ‘unethical’ methods, etc. in the forums, in his newsletter, and when he speaks at conferences. I’ve never seen him voluntarily add the proviso that what he says works if the search terms are not very competitive. Instead he continues to advise people to do it his way and the rankings will follow. In my view, he intentionally misleads people – either that or he is so dumb that he hasn’t learned from his own failures. I received an email a few days ago from a search engine optimizer (a stranger to me). He asked for prices for my search engine optimization services for a few particular search terms for one of his clients. Looking at his website, I found an article which contained a few paragraphs about why not to use spam methods of seo. (“Spam” is what the ‘ethical’ SEOs call any method that they disapprove of). I don’t know if this person is an active ‘ethical’ seo or not, but the email clearly shows that this person had failed with the search terms and that, once again, so-called ‘ethical’ seo methods cannot compete. The ‘ethical’ search engine optimization method is sound, and can be effective when the search terms are not competitive. This article describes it – Search Engine Optimization – the basics. It’s the first step in optimizing a website and it’s pages for the search engines, but that’s all it is – the first step. Most search engine optimizers perform this first step on their clients’ websites but, whereas most optimizers continue with further optimization, ‘ethical’ search engine optimizers stop. If it doesn’t work, there’s nothing more they can do. Ordinarily, the self-styled ‘ethical’ SEOs could be laughed off as cranks, but the Internet is a small world and there aren’t many places where people can go for search engine optimization advice. It doesn’t take many ‘cranks’ on a crusade to dominate those places to the extent that seo novices and webmasters can be easily misled into thinking that their views are shared by the majority of search engine optimizers and their methods are the ‘normal’ or ‘proper’ way of doing search engine optimization – none of which is true. The recommendations for and against the following forums are based solely on each forum’s tolerance of ‘unethical’ views. Whether or not a person is likely to find information on both sides of the debate is stated in each forum’s description. The biggest by a long way. It has a massive active membership and is not dominated by people of any particular seo persuasion. The only thing wrong with it is that it’s too big, and useful information isn’t always easy to find without starting your own threads or wading through some very large ones. Used to be the biggest forum around but, as Webmaster World grew, Search Engine Forums shrank into a smaller, more useful forum. A forum where views of all shades are both tolerated and encouraged. The forum is growing but is still small enough for discussions to maintain a ‘personal’ feel. A small forum where views of all shades are acceptable but, due to the general inclination of the moderators, the overall tendancy is to the so-called ‘ethical’ side. Small forum, owned and completely dominated by an ‘ethical’. The carefully selected Moderators naturally share his views. Anyone expressing views that don’t agree with theirs are likely to be verbally savaged, insulted and effectively driven out. They don’t delete posts that express views with which they disagree, but there is no attempt at genuine discussion – only at dominating, savaging and insulting. Since most posts are written by the Moderators, it is virtually impossible to gather the information required to form your own opinions. For all that the ‘ethicals’ strive to stay within the search engines’ rules and guidelines, and for all their efforts to spread their ‘gospel’ all over the Internet world, the search engines themselves don’t approve of the seo methods that the ‘ethicals’ accept! For instance, Google is against search engine optimization of any kind (see Search Engine Optimization and Google), and that includes what the ‘ethical’ search engine optimizers do. “THE proven method of ranking well in your desired search phrases is simply to provide great content with appropriate page architecture in a category that is not already dominated by cheaters doing keyword stuffing and using other unethical techniques to gain top positions”. It is part of an article entitled “Unethical SEO and Guarantees”, which can be found here. This paragraph supports what I’ve written about in this article and in the SEO copywriting article. In the paragraph, the author concedes that it is pointless trying to compete in competitive categories by using the so-called ‘ethical’ techniques. With his “proven method”, if your category is being competed over, you simply can’t rank well for “your desired search phrases”. NOTE: He uses the word “cheating” to describe certain SEO techniques of which he doesn’t approve. No SEO technique is cheating. Some are unethical, but none of them are cheating. This article has been the subject of discussion in a number of forums recently. One discussion at the Webmaster Forum is very positive, whereas the one at the Highrankings forum started out to be generally negative, though not completely so, but ended up revealing the truth. Because of what the forum’s owner said and did during that discussion, I decided to reveal the name of this article’s “eye-opening example”. It is Jill Whalen – the forum’s owner. During the discussion, Jill called me a liar and said that I was twisting things. Soon afterwards she admitted that what I’d said about her, both there and in this article, is actually true. At one point she stated that “Nobody EVER needs to use spam techniques to get ahead” (the capitalization is hers). By “spam techniques”, she means what she calls ‘unethical’ techniques. And then she went on to say, “I freely admit that I don’t optimize for highly competitive keywords………..I don’t optimize for one-word keywords, and many two-word phrases that might be extremely competitive”. In other words, Jill Whalen doesn’t even attempt to optimize for competitive search terms because she knows that her methods can’t succeed, and yet she keeps on telling people that “Nobody EVER needs to use spam techniques to get ahead”. She even holds seminars and charges people money to listen to it. She knows the truth and yet she continues to deceive people – and she takes money for deceiving them. Now, that’sunethical. In another thread in her forum she said, “If a phrase seems awfully competitive, it can be “scary” to optimize for, in that the optimization might not work. I don’t like to fail, and I might not shoot for a phrase because I’d be afraid to fail”. She chooses the weaker search terms and avoids the competitive ones because she knows that her methods would fail with them. But it’s the competitive search terms that deliver the bulk of the traffic.